The trio sonata was a very popular genre in the early 18th century. In particular amateurs - whose technical skills were considerable - were very keen to lay their hands on any publication with this kind of music. 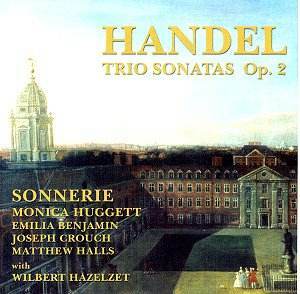 Publishers took advantage of it by trying to publish as many collections of trio sonatas as possible. In the liner notes of this disc Wiebke Thormählen gives a striking illustration of how far publishers were willing to go in this respect. The London publisher Walsh printed the trio sonatas opus 2 under the name of the Amsterdam publisher Roger, and made sure the publication was riddled with errors in order to infuriate Handel in such a way that he was only too happy to allow Walsh to publish an 'authorised' edition. Another way to boost sales was to mention a variety of instruments on which the sonatas could be played. Therefore the fact that the Walsh edition refers to oboes and recorders, alongside violins, on the title page doesn't necessarily reflect the wishes of the composer. But, in general, composers in the 18th century were quite flexible as far as the scoring of their chamber music was concerned. So there is no reason to object to a performance with other instruments than those which the composer in all likelihood had in mind when he wrote them. In the case of the trio sonatas op. 2 by Handel it is only the Sonata I which seems to have been written specifically for transverse flute and violin by Handel, considering the fact that in the partbooks of all prints it is designated for that combination. It is performed this way on this disc, whereas all other sonatas are performed with two violins. Since no autographs of these sonatas have survived it is impossible to decide when they have been composed. It seems, however, that five of them date from the years 1717/1718. Only the first sonata goes back to Handel's youth in Germany and dates perhaps from 1702. Over the years I have often been disappointed about the interpretation of baroque music by musicians and ensembles of the younger generations. The problems are often the same: too little differentiation within a piece, either between sections or movements, an equal treatment of all notes, a lack of dynamic contrast. This recording by Sonnerie demonstrates how to play baroque music. This is an extraordinary engrossing interpretation. Or perhaps I should say: the musicians tell an engrossing story. They constantly keep the listener on his toes. The slow movements are very expressive, with a strong interaction between the players. The fast movements are really exciting and dramatic, with basso continuo players who push the ensemble forward. There is a lot of differentiation in dynamics and articulation here as well. The ornamentation is always tasteful and well played, with the right amount of variety. If one has listened to a number of recordings with baroque chamber music which are rather rigid and inflexible, this disc is like a breath of fresh air. I can only strongly recommend this excellent performance of some of Handel's greatest chamber music.